As you might’ve heard, The Gruffalo and The Gruffalo’s Child are currently holidaying in the Hopster world. They’re massively enjoying their time there – lots of Owl Ice Cream and Scrambled Snake to go round. To make sure you and your kids have just as much fun, we’ve put together some free Gruffalo printables – including a Gruffalo Mask and other Gruffalo colouring pages – to keep the little ones entertained! Here’s a fun Gruffalo mask to print out, cut out, put on. 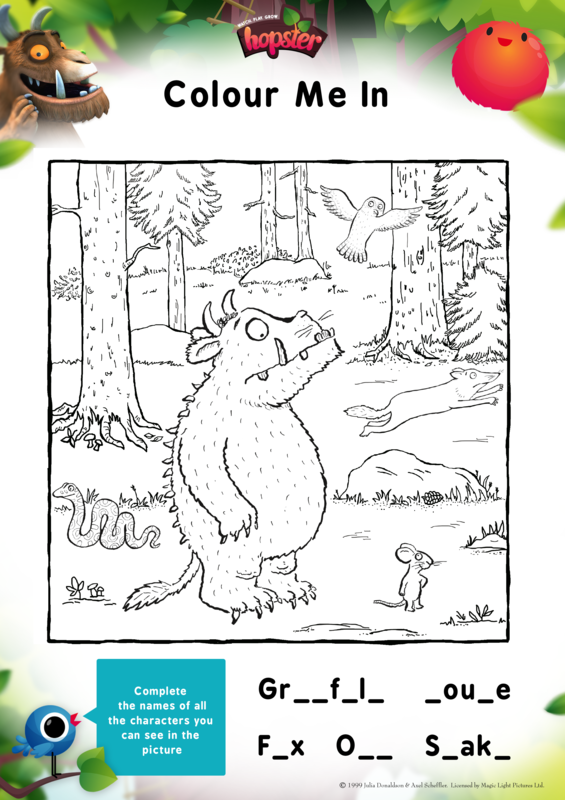 It doesn’t take more than a few minutes, and you can even colour it in to make for a super growly Gruffalo effect. When you’re done and having fun, why not post your best Gruffalos on our Facebook page – who knows, there might even be a little prize in waiting! Squirmy worms, beautiful butterflies, creepy caterpillars – how many of these bugs can you identify on a woodland walk? 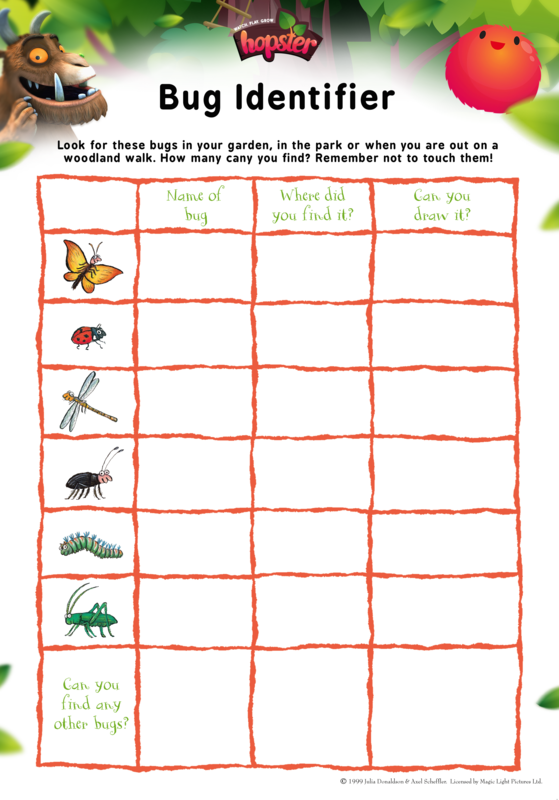 Print out the chart and take it with you to have some fun outdoors. We actually found it quite tricky ourselves (I mean, when was the last time you saw a caterpillar in Bermondsey, London? ), and would love to see the results of your next family exploration over on Facebook! For those rainy afternoons, here’s a colouring in sheet. Or even for the sunny afternoons, however you like it! Get out your fanciest colouring-in pens, and see how creative you can get. 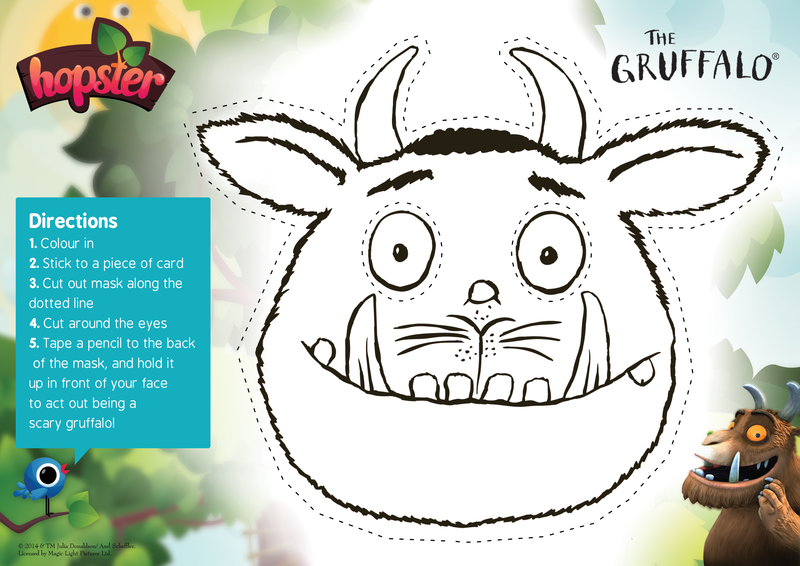 Perhaps, after watching The Gruffalo on Hopster, you could colour him in and see how funny he looks in pink, yellow, or green? In any case, send us your kid’s best efforts on Facebook – it’ll make our day! Hopster is an innovative children's development app for ages 2-6, where they'll find books, drawing, games, music, their favourite TV shows, and more. For a small monthly fee kids can access the best preschool content in a safe and ad-free digital app.